Lady Briar is scorned for her appearance. Princess Rose is adored for her looks. Unbeknownst to them, one or both may bear a curse that only true love can break. But the girls have little time for curses anyway - along with their friend Jack, they are busy plotting the downfall of the evil giant who plagues their kingdom. But how can children succeed when the adults are afraid to even try? And what if the curse manifests? Whose love could be true enough to save the day? 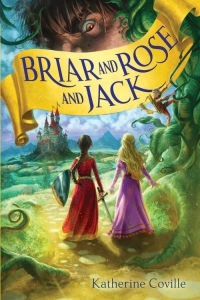 Sumptuous storytelling combines Sleeping Beauty with Jack and the Beanstalk in a magical exploration of prejudice, justice, and the meaning of true love.